Anne Ursu was raised in Minneapolis and graduated from Brown University. She has worked at a major book retailer, as the theater critic for City Pages in Minneapolis and as an arts writer for the Portland Phoenix in Maine. She is also a professor of writing for children at Hamline University and a lifelong Minnesota Twins fan. Anne lives in Minneapolis with her son, two cats, and lots of books. Visit Anne Ursu’s website. Breadcrumbs — (2011-2013) Ages 8 and up. Publisher: Once upon a time, Hazel and Jack were best friends. But that was before he stopped talking to her and disappeared into a forest with a mysterious woman made of ice. Now it’s up to Hazel to go in after him. 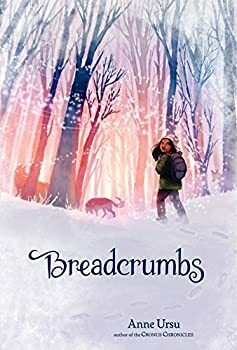 Inspired by Hans Christian Andersen’s “The Snow Queen,” breadcrumbs is a stunningly original fairy tale of modern-day America, a dazzling ode to the power of fantasy, and a heartbreaking meditation on how growing up is as much a choice as it is something that happens to us. Hazel and Jack have always been best friends, bonding over their shared love of science fiction and fantasy. They play make-believe “superhero baseball” and hang out in a derelict house they call the Shrieking Shack. But now that they’re eleven, Hazel’s mom is pushing her to make some female friends, and Jack is more interested in hanging out with his male friends than with Hazel. Then the impossible happens: Jack is taken away by a mysterious witch, and Hazel is the only one who can rescue him. Anne Ursu’s Breadcrumbs is a retelling of the fairy tale “The Snow Queen,” and it’s fantastic. The Cronus Chronicles — (2006-2009) Ages 9-12. Publisher: See that girl, the one with the bright red hair, overstuffed backpack, and aura of grumpiness? That’s Charlotte Mielswetzski. And something extra-ordinary is about to happen to her. Oh, it’s not the very cute kitten that appears out of nowhere and demands to go home with her. It’s not the sudden arrival of her cousin Zee, who believes he’s the cause of a mysterious sickness that has struck his friends back in England. It’s not her creepy English teacher Mr. Metos, who takes his mythology lessons just a little too seriously. And it’s not the white-faced, yellow-eyed men in tuxedoes, who follow Charlotte everywhere. What’s so extraordinary is not any one of these things… It’s all of them. And when Charlotte’s friends start to get sick one by one, Charlotte and Zee set out to find a cure. Their quest leads them to a not-so-mythical Underworld, where they face rhyme-loving Harpies, gods with personnel problems, and ghosts with a thirst for blood. Charlotte and Zee learn that in a world overrun by Nightmares, Pain, and Death, the really dangerous character is a guy named Phil. And then they discover that the fate of every person — living and dead — is in their young hands. In her dazzling debut for young readers, Anne Ursu weaves a tale of myth and adventure, danger and magic that will keep readers engrossed until the very last secret is revealed. Spilling Clarence — (2002) Publisher: What if you could suddenly remember everything that ever happened to you, every joy and every sorrow that you had ever endured? Would it be a blessing — or a curse? This is the fate of the residents of the town of Clarence, who fall under the spell of a strange and powerful drug that unlocks their memories. The past comes flooding back without the buffer of time, and the townspeople, young and old, find themselves awash in their own reminiscences — of love and death, of war and childhood, of happiness they’ve experienced, and sins they’ve committed. Beautifully rendered with a light comic touch, this bittersweet novel is about more than the sum of its beguiling parts. Spilling Clarence explores our relationship with our histories, the seductive pull of regret, the unreliability of memory, and the bliss of forgetting. A universe peopled by exquisitely drawn characters, Spilling Clarence is a moving introduction to the impressive talents of an exciting new writer. The Disapparation of James — (2003) Publisher: From the highly praised author of Spilling Clarence, a luminous novel about the joy of family and the perils of loving. The Woodrow family is going to the circus to celebrate Greta’s seventh birthday. When five-year-old brother James eagerly volunteers to join the magic act, his parents watch with pride as he climbs onto the stage alongside the clown. The trick is spectacular and applause rings through the crowd as James disappears — vanishing before their very eyes. The trouble is, James really did disappear… into thin air. In the aftermath of James’s disappearance, with the police investigation providing no clues, the laws of the universe come into question. His mother becomes lost in her dreams and his father becomes obsessed with the clown, while his big sister Greta sets out to figure out what happened. A novel peppered with dreams, premonitions, and possible realities, The Disapparation of James is a work of enormous sensitivity, tenderness, and wit. CLICK HERE FOR MORE BY ANNE URSU.